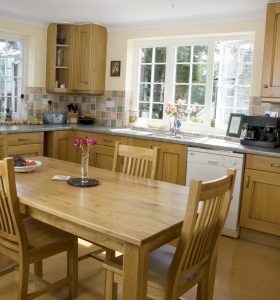 The Croft Oak kitchen is contemporary take on a traditional oak kitchen with some antiquing to enhance the traditional side of the offer. 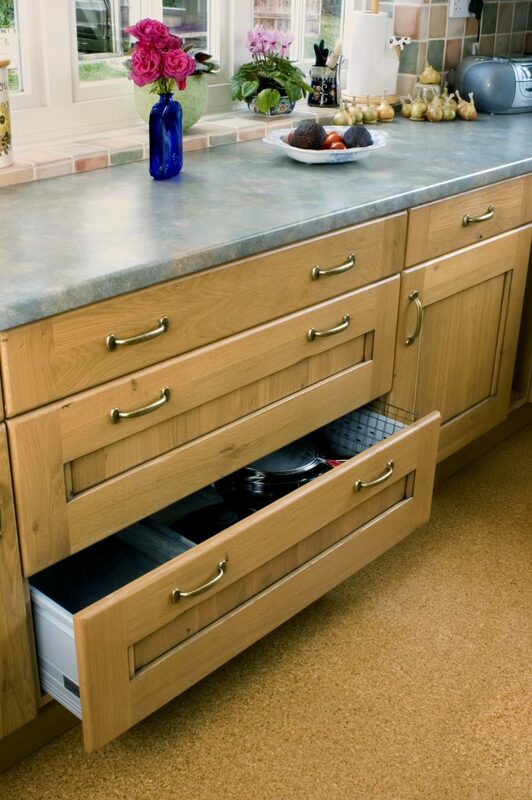 Though now discontinued there are similar kitchens amongst our current ranges. A more traditional door frontage would offer a bead fully around the inside of the frame to the panel, while this door offers a bead to left and right, while not to top and bottom. 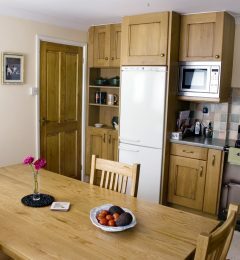 In Yarcombe Devon, we installed a semi-contemporary antiqued oak kitchen with laminate worktops. 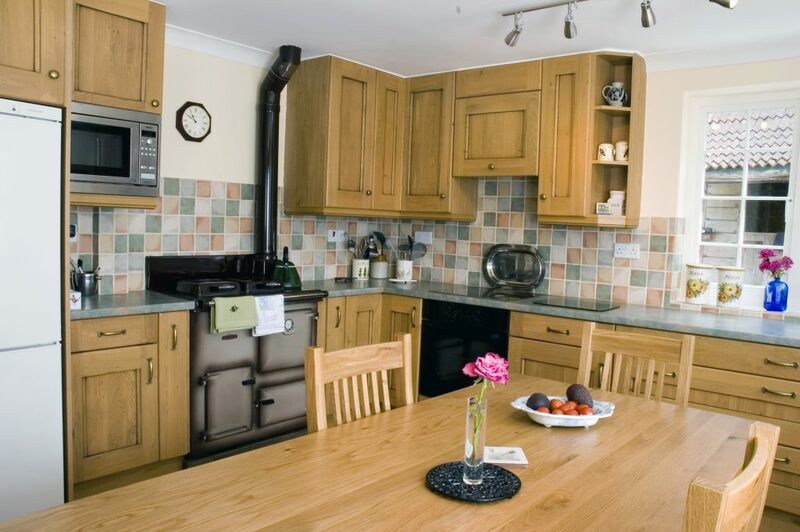 With the rigid cabinets, laminate tops, a mix of client and new Bosch appliances, and various internal fittings this kitchen came to less than £10,000 including vat. 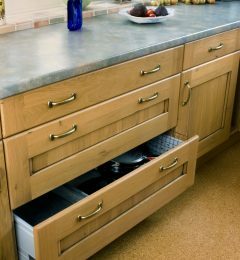 When working with a laminate worktop the sink has to be an inset sink as one cannot cut and form a sink drainer for an under mount or Buttler sink in this material. Our client came to us from local and internet advertising; it was a pleasure to work with an entirely new client that had not been recommended to us. One feels that one is doing something right when a client offers confidence in oneself without their having prior knowledge. 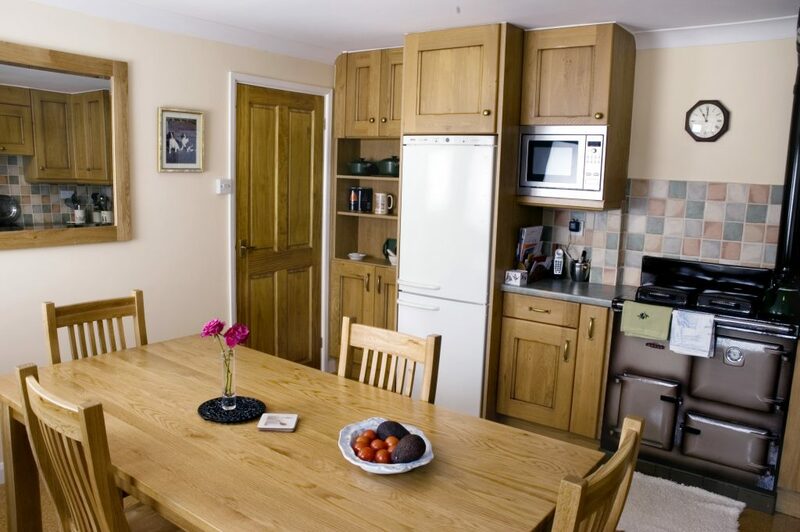 The clients had lived in this property for many years and it was time for them to have a new kitchen. Our fitter Simon Raymond carried out the kitchen installation. 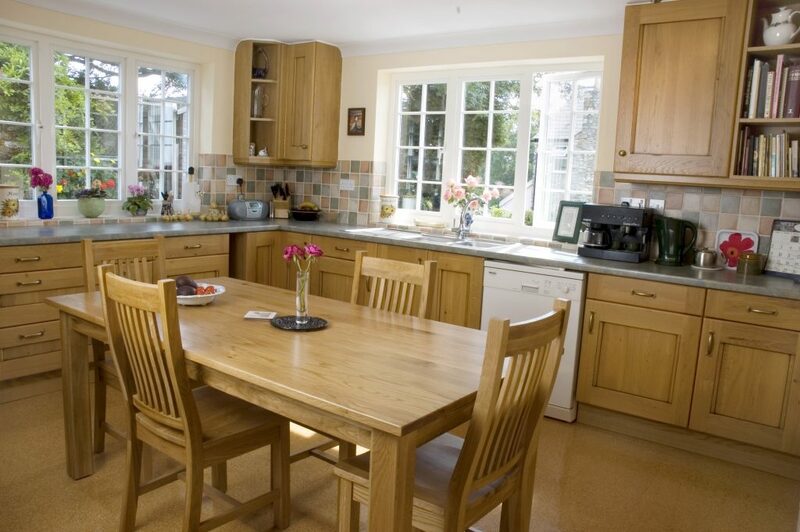 In this job, care had to be taken of the client’s existing cork floor which could otherwise have easily been damaged. 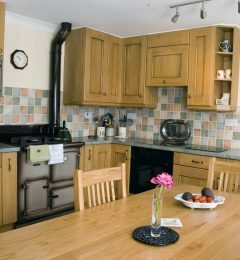 Electrical, plumbing and wall tiling works were also involved; to complete the refurbishment of the kitchen as viewed here. This particular client wanted 900mm tall wall units when the most common are 720mm tall. Their ceiling was only 2320mm when a tall wall unit will naturally top out at 2300mm high overall. You will note from the pictures that we were unable to place a cornice over the wall units in the remaining 20mm. Those with a Raburn will know that they are only 500mm deep, with this in mind we made the cabinets to left and right of the Raburn only 500mm deep; this can be seen when one looks at the client fridge housing at 600mm deep projecting forward from the cabinet line. We are often called upon to build in existing white goods into a new design, this saves the client money and waste.